After a prolific career making mathematical instruments, Christoph Schissler died in 1608, at the age of about 77. Only a small proportion of his surviving instruments date from the last 20 years of his life. This particular compendium, dated 1608, appears to be his final instrument. 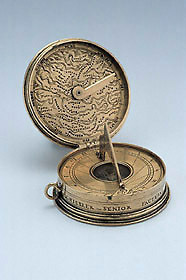 Compared to his many earlier productions it is a relatively limited device, comprising an inclining sundial, a lunar volvelle, a map of central Germany and a table of the latitudes of places.